The Selectmen’s Chambers were filled past capacity for the February 27th Public Hearing on single-use plastic bags (the on-demand video of the hearing is here). Amy Hurley introduced the members of Girl Scout Troop 78239, who advocated for the ban using the tenets of Girl Scout law. In all, nearly twenty people spoke in favor of the plastic bag ban, including six members of the Troop 78239. The sentiment was overwhelmingly in favor of an outright ban through an ordinance.Following the public hearing, each of the Selectmen in turn spoke to their views on eliminating single-use plastic bags in Needham. The Board as a whole continues to favor moving forward to implement a voluntary “ban” by the five largest retailers in town – Roche Brothers/Sudbury Farms, Trader Joe’s (which already does not use plastic bags), CVS, Walgreens and Staples. The Board of Selectmen will have a further discussion of the plastic bag ban at their upcoming meeting on Tuesday, March 13th. The discussion is scheduled for 8:30 pm. Select Board Chair Marianne Cooley reported that Roche Brothers informed her that they will stop using plastic bags by March 11th. As of March 8th, Roche Brothers and Sudbury Farms have already removed plastic bags from their Needham stores. Please thank them next time you are shopping for groceries! Below is the record of the hearing as included in the minutes of the Selectmen’s Meeting of February 27th. Ms. Cooley explained that the origin of the Plastic Bag Check-Out Policy largely came from Green Needham and citizens asking if the Board of Selectmen would consider a plastic bag policy. She noted former Needham High School students Christopher Thomas, Vinh Truong, and Bony Ganugapanta brought the idea forward to the Board of Selectmen at its meeting on May 24, 2016. She stated the Board researched the issue, engaged with citizens, and invited the Town’s largest vendors to discuss a plastic bag ban in Needham. Ms. Cooley indicated some stores never use plastic bags, while other stores indicated they would be willing to work with the Town. A plastic bag check-out policy was formulated asking for voluntary compliance by larger stores (larger than 3,500 sq. ft.). Ms. Cooley said most letters received by the Board of Selectmen favor the ban, 3 letters oppose the ban. She said several people indicated they would be willing and supportive if stores wished to charge for the use of a bag. Ms. Cooley mentioned letters received from Ms. McCracken’s 2nd grade class at Newman Elementary School. Ms. Cooley opened the public hearing and invited comments. David Ecsedy, 20 Holland Terrace, Solid Waste Advisory Committee member, said plastic bags contaminate the recycling bins at the RTS and that staff must work harder to remove bags, otherwise the RTS receives less money for its recyclables. He said the plastic bags are light, making a mess when they blow all over. Mr. Ecsedy said the City of Newton implemented a ban with no citizen objection, and the Town of Arlington will implement its ban on March I , 2018. Byron Doerfer, 149 Manning Street, said the issue affects the world and harms the environment. He stated production of plastic bags and inadequate methods of disposal/recycling convinced him a ban must be enacted in Needham. He said he was shocked to learn the amount of oil needed to create only 14 plastic bags is equivalent to the amount of gas it takes the average car to drive 1 mile, most bags ending up in landfills, taking more than 1000 years to degrade. Mr. Doerfer commented Roche Brothers is the only recycling collection location in Needham. He stated recycling plastic bags is cumbersome, costly, and inefficient, noting the Needham RTS has also requested plastic bags not be placed in commingle bins. Mr. Doerfer said the benefits of plastic bags are far outweighed by costs. 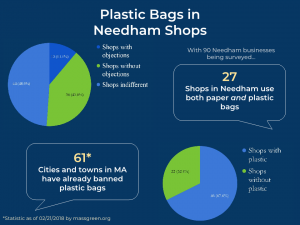 He commented Needham is a leader on many issues but has fallen behind, as 60+ Massachusetts communities already have a plastic bag ban in place. Rob Fernandez, 19 Bradford Street, Green Needham Collaborative Bag Ban Team Chair, said the hearing is an important step in the initiative, as started by Chris Thomas and other students over two years ago in the Greater Boston Project interdisciplinary course for high school seniors. Mr. Fernandez said the Bag Ban Team consists of Town Meeting and Environmental Club members. He said the Board will hear comments from a number of members, as well as Girl Scouts. Mr. Fenandez said efforts will continue after the public hearing as there are plans to purchase and distribute reusable bags to small businesses encouraging use and to promote the shift away from plastic. He urged the Board of Selectmen pass a by-law eliminating single use plastic check-out bags. Irwin Silverstein, 44 Reservoir Avenue urged people to reduce, reuse, and recycle plastic and paper bags. He said he supports the effort to reduce plastic in the environment. Amy Hurley, 154 South Street, Town Meeting member, Girl Scout Troop #78239 leader said the Girl Scouts have spent a year learning about the issue and collected signatures supporting the ban. Six Girl Scouts applied the Girls Scouts pledge as a framework for telling the Board why they are in support of the plastic bag ban. David Rudolph, 143 Highgate Street, Bag Ban Team member, Sierra Club of MA, summarized points in a letter to the Board of Selectmen by Emily Norton, Executive Director of the Sierra Club of MA. Mr. Rudolph said a by-law is the simplest method for reducing the use of plastic bags. Mr. Bulian asked Mr. Rudolph for the status of the MA state legislation on the use of plastic bags. Mr. Rudolph said the Senate may vote on the issue, but the House probably will not vote on it this year. Ms. Cooley pointed out the issue has made it farther than ever before in the legislature. Kara Holmquist, 286 Rosemary Street, Town Meeting member, employee of MA Society for the Prevention of Cruelty to Animals supports a by-law for all stores. She said thin film plastic bags have a severe impact on animals, people must be in the habit of bringing their own bag, and stores can save money by giving out fewer bags. She said the issue passed in the state senate, but will not take effect until August 2019. Ms. Holmquist urged the Board to think about animals and the environment. Lance Brown, 18 Webster Street, Town Meeting member suggested implementing a five cent fee for any bag (paper or plastic). He said Washington D.C. implemented a bag fee, and within a few months it became the “norm” for people to either bring their own bag or not get a bag. He supports a bag ban by­ law and charging a fee for bags. Brian King, 8 Prospect Street supports the comments by the public. He reiterated Sudbury Fanns and Roche Brothers already credit five cents per bag when people bring their own bags. He said these are small things that will benefit the community. David Dirks, 674 Webster Street, Green Needham Bag Ban Team member said opinion in the room, and that of people he spoke with, unanimously favor a bag ban. He commented on the enviromnental impact and that people need to do their part. Jeanne McKnight, 100 Rosemary Way said grocery stores in Puerto Rico charge ten cents per bag, which are sturdy and reusable. She said she supports a plastic bag ban. Ms. McKnight clarified plastic bags for fruit and vegetables will still be available. She also urged the supermarkets continue to provide recycling bins. Michael Bailit, 33 Perry Drive urged the Board of Selectmen to enact a mandatory ban, not a voluntary ban. Ms. Cooley closed the public hearing. She said the Board of Selectmen has been notified by Sudbury Farms and Roche Brothers that they would be implementing a plastic bag ban beginning Sunday, March 11, 2018. She thanked people for their input. Mr. Bulian clarified the ban is “voluntary” for big box stores and requires 100% compliance of stores larger than 3500 sq. ft. He said if 100% compliance is not achieved, a by-law will become a possibility. Mr. Handel thanked Christopher Thomas, Vinh Truong, and Bony Ganugapanta, former Needham High School students, for their effort in bringing the issue forward in 2015. He concurred plastic bags must be banned. Mr. Matthews offered his opinion saying a voluntary reduction approach is sound at this point in time, recognizing people in attendance may not feel the same. He commented he is not opposed to use the authority of government to accomplish the ban. However, he said careful consideration must be given to get the best outcome possible. Mr. Matthews commented on human caused climate change and degradation of the enviromnent, which includes single use plastics. He commented on by-laws in other towns, noting there are other problems. He said even a mandatory by-law will only address single use, point of sale plastic bags, which he said are only a fraction of all plastic bags used for packaging and distribution, and that there must be a wholesale change in the way consumer products are packaged and distributed. He reiterated that while the policy focuses on retailers with more than 3,500 sq. ft, it also signals smaller businesses to minimize point of sale plastic. Mr. Matthews said the Board wants people to be mindful as to whether they need the bags or if there is a better way. He said that by asking for support through a voluntary approach while attempting to get “buy in” from the community and businesses, he is optimistic the approach will help the Town. Mr. Matthews said ultimately, a long term, large scale solution is needed. Mr. Matthews said he favors a five cent fee for bags, cautioning he is not sure the Board of Selectmen can impose a mandate. Mr. Borrelli said he is enlightened by the facts and figures, and supports the voluntary bag ban for larger stores. He asked drop off points for recycling plastic bags be included with the letter and policy sent to the connnunity. He said the conversation will continue.